Antique Japanese sword tansu, made with Kiri (paulownia) hardwood, all original finish. 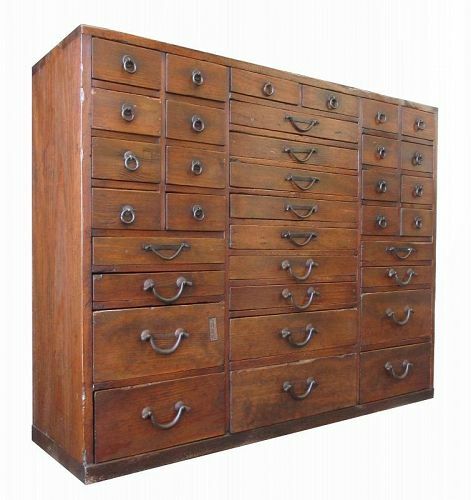 The piece holds two large drawers and two small corner drawers, accented with heavy iron handles, lock plates, and corner hardware. The sides of the piece feature long iron fittings for carrying. Antique Japanese ikebana basket, all hand-woven with sections of bamboo. The body is a cylindrical shape, narrowing towards the bottom four short feet. The handle is made with natural Wisteria branches. The interior holds two small wooden containers to hold beautiful arrangements of flowers. Japanese antique apothecary (medicine) chest for a merchant of herbs. Made of 100% hinoki (Japanese cypress) wood with 35 drawers of various sizes. Hand forged Iron hardware includes hirute and ring shaped drawer pulls. From the Kansai Area. Antique Japanese zenibako, or money box, made of heavy Keyaki (elm) wood. 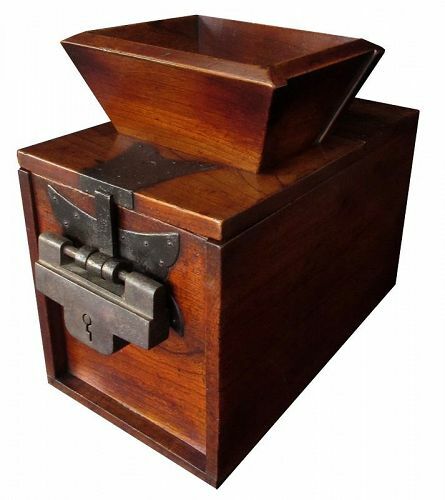 The piece uses a funnel top lid for collecting temple offerings, secured with a very large iron front lock. Original condition. With mortis and tenon joinery. Japanese woven suiban. This low, shallow container is used for ikebana flower arranging. Rectangular in form, this suiban is raised on low feet. A grain or leaf-like design is woven into all sides and the corners have intricate knot work. An oval shaped metal container sits perfectly inside for holding water. 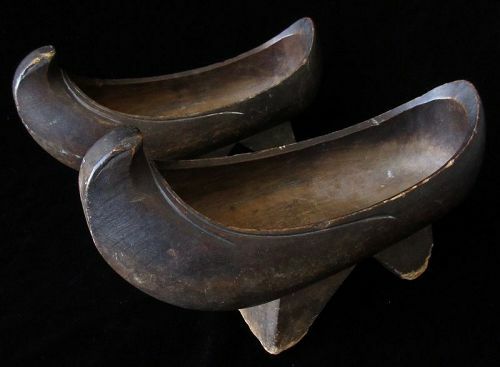 A traditional pair of Korean hand-carved wood clogs, or Namakshin. This type of footwear was originally introduced to Korea by shipwrecked Dutch sailors during the mid 1600s. Similar to the Japanese geta, Namakshin have two stilts beneath each shoe, designed to protect one's feet from muddy, wet ground. 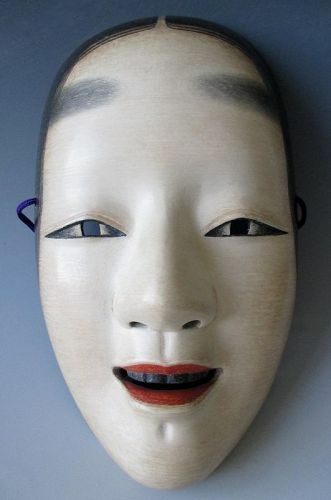 Beautiful Japanese carved Noh theater mask of Zo-onna (beautiful woman). Carved out of hinoki (Japanese cypress) wood and painted with seashell and natural pigments. This mask is masterfully carved and painted with subtle detail like her very slight smile and the small dimple just above her chin. The mask is signed and has it's original tomobako (also with the same signature). Unusual Japanese small gyosho bako (merchant's box) made with Kiri (Paulownia) wood in all original finish. 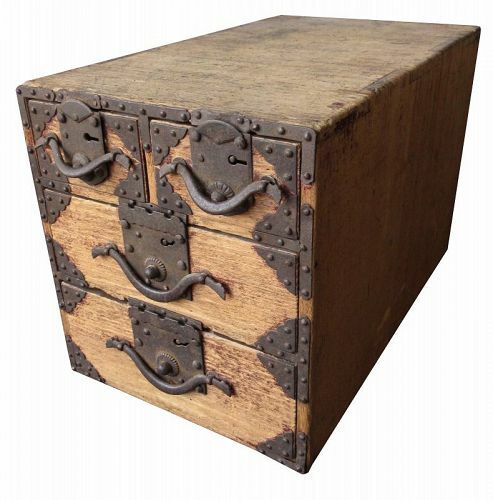 The box holds four drawers, with decorative black iron plating and handles. The top 3 drawer interiors have been lacquered in black while the bottom drawer has also been lacquered in red. With original keys included. 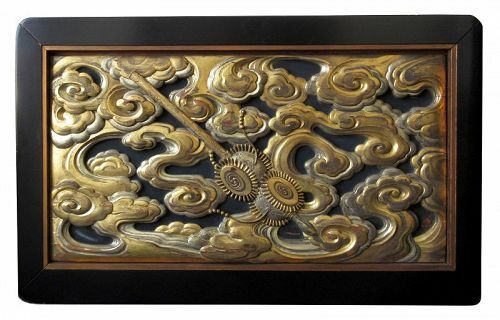 A Japanese Buddhist temple wall carving / transom, with red and gilt lacquer pigments. Carved with the image of an instrument against a ground of heavenly clouds. Professionally framed to be mounted and displayed on the wall. A framed pair of Southeast Asian palm leaf manuscripts, each side covered in gold leaf, with ornate filigree in red, and scenes of dancing people and beasts. 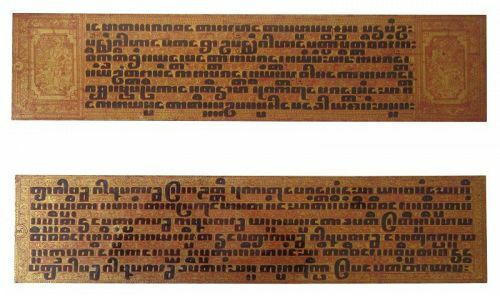 With lines of text written in black lacquer pigment. These manuscripts have two holes each to be strung and bound together as a book. Professionally displayed suspended in glass and framed.